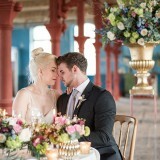 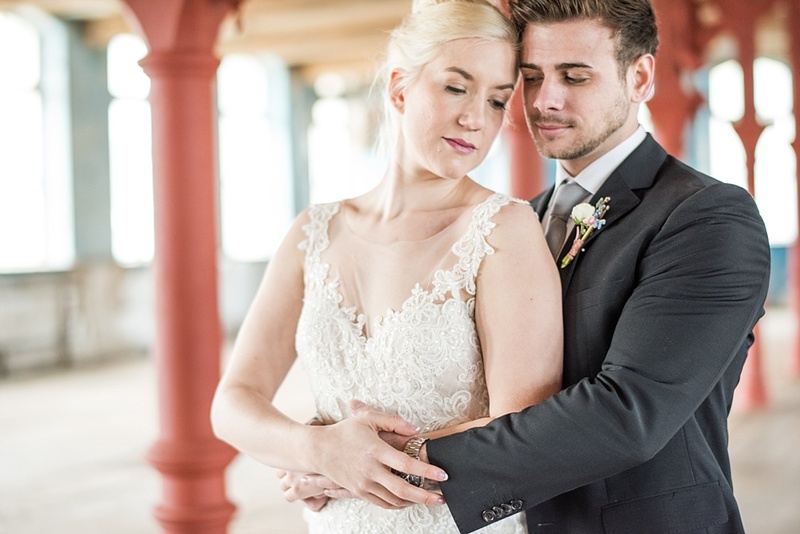 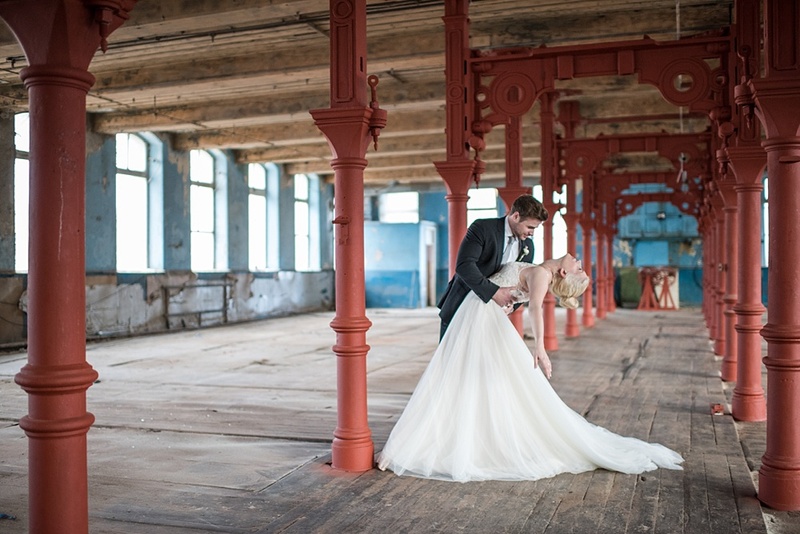 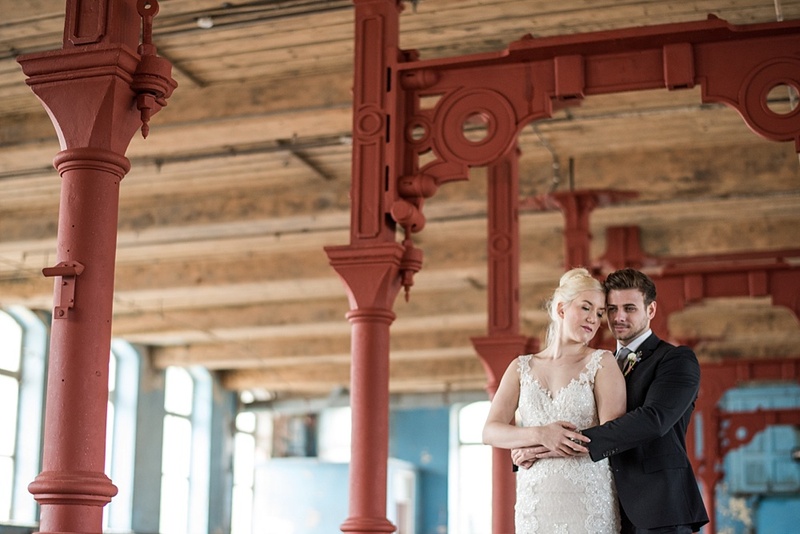 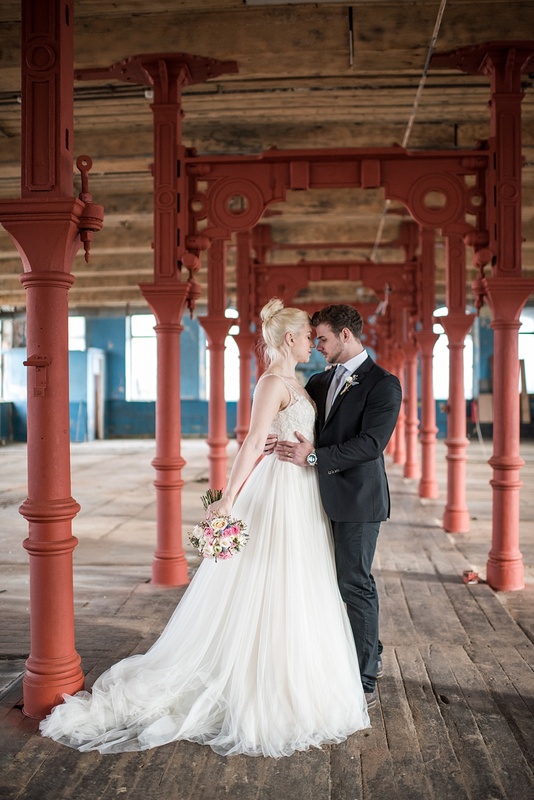 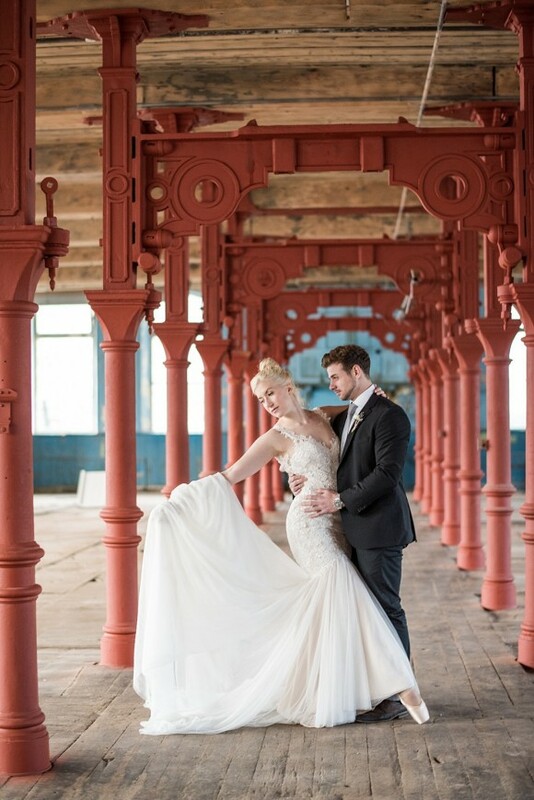 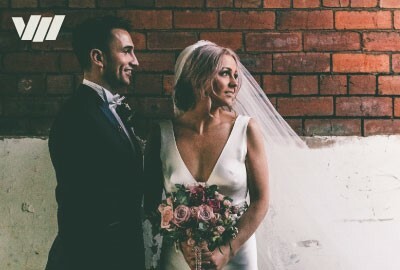 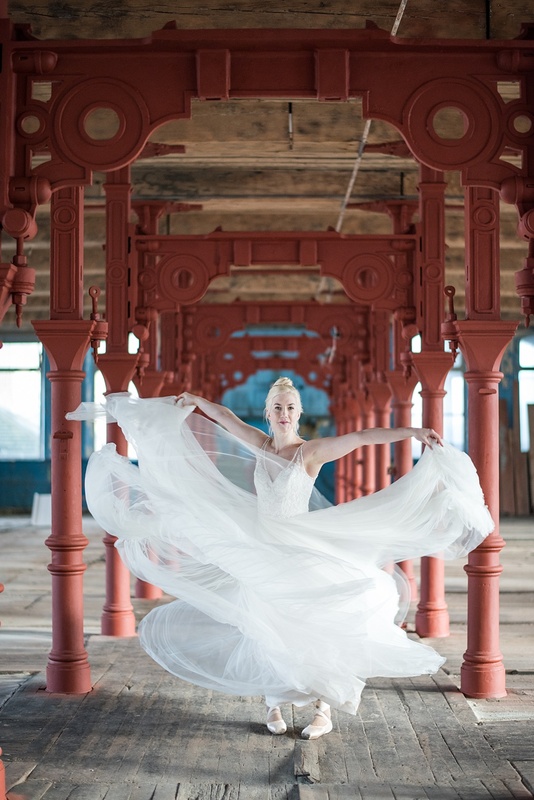 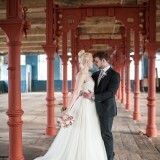 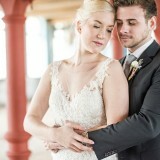 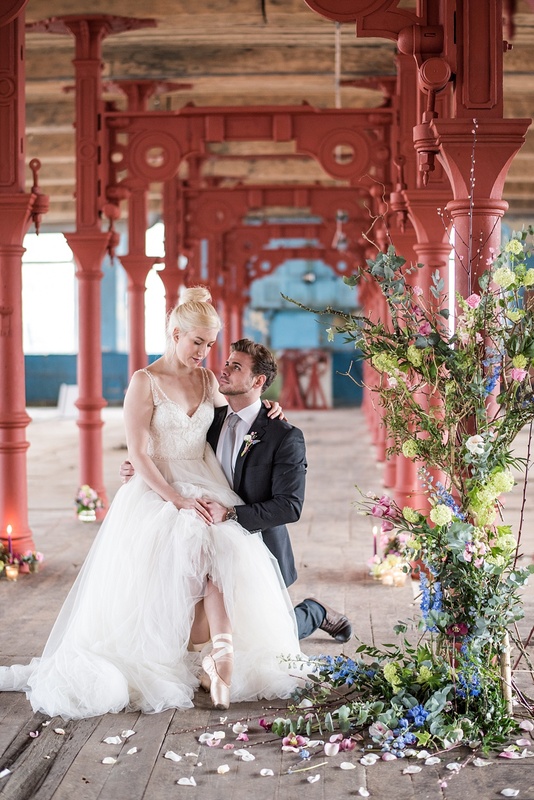 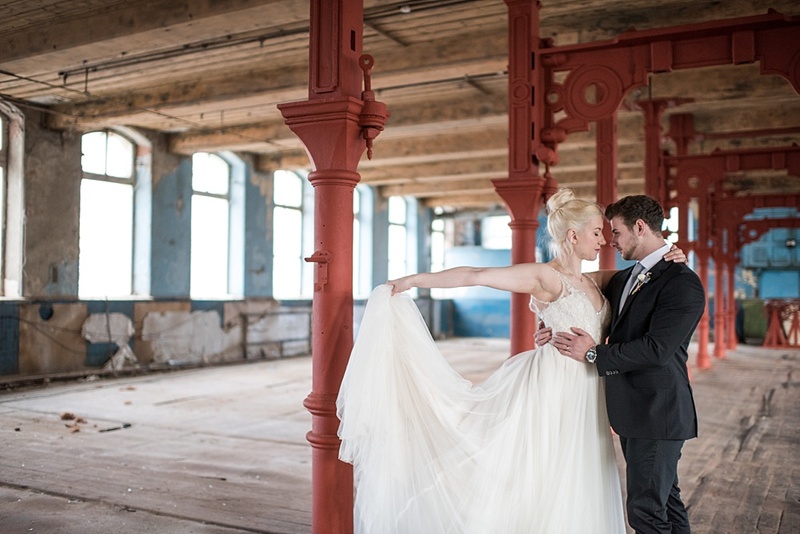 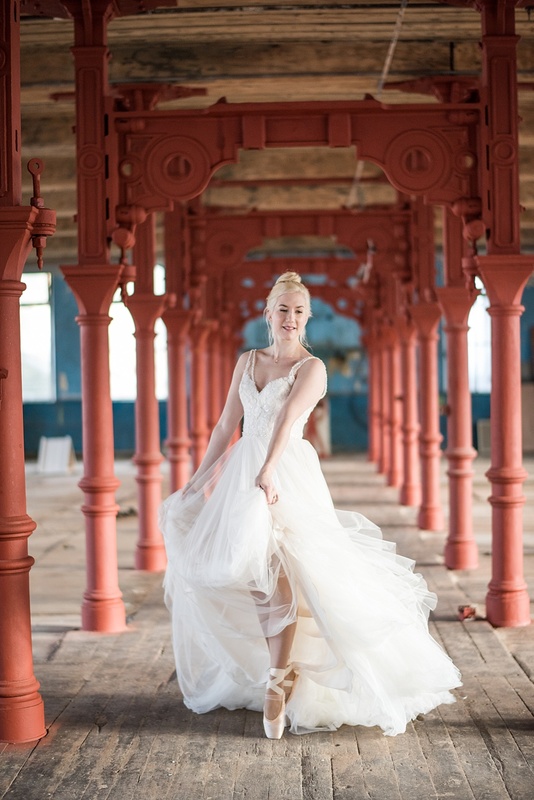 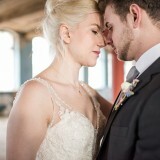 Theatrical drama lies at the heart of today’s stunning styled shoot at Dalton Mills in Keighley. 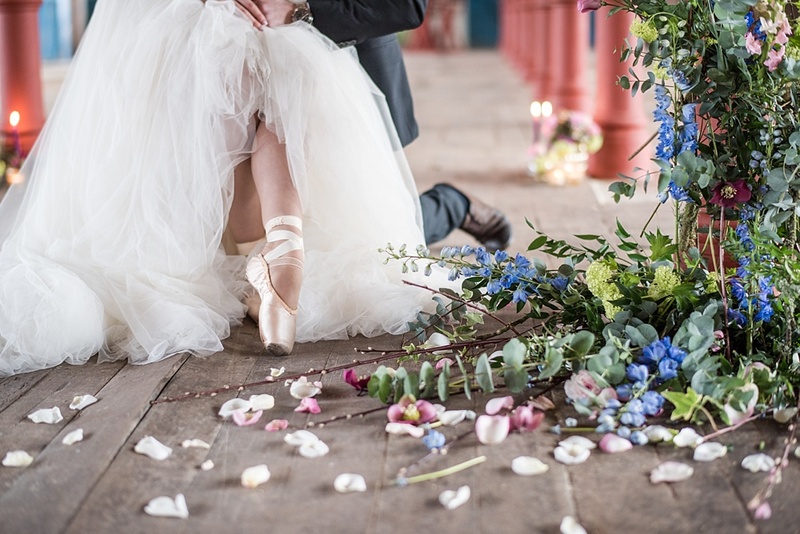 Adopting a romantic ballet theme, this styled shoot captures the spellbinding performance of the bride, as she pirouettes in her gorgeous wedding gown. 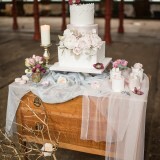 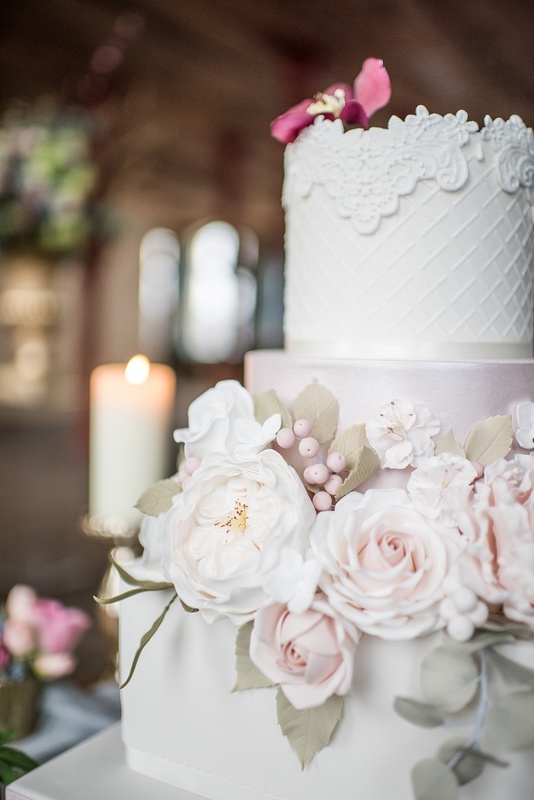 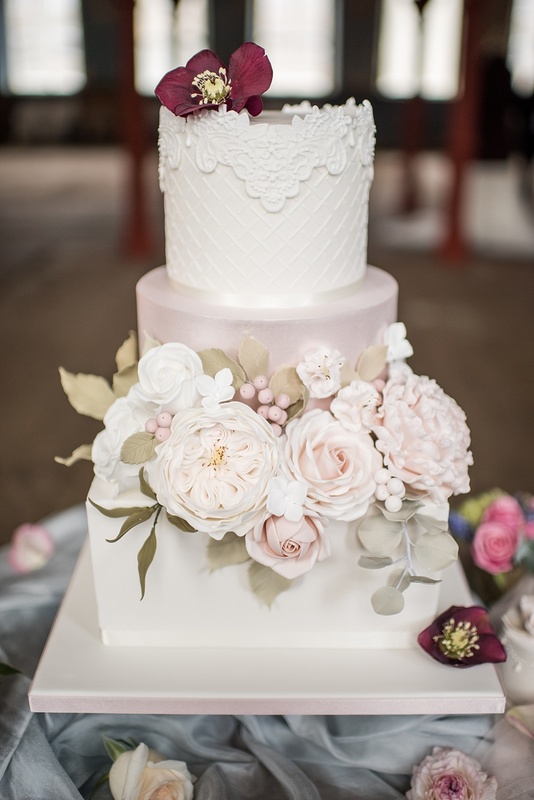 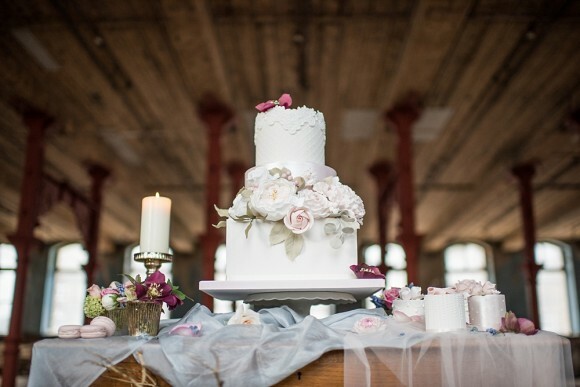 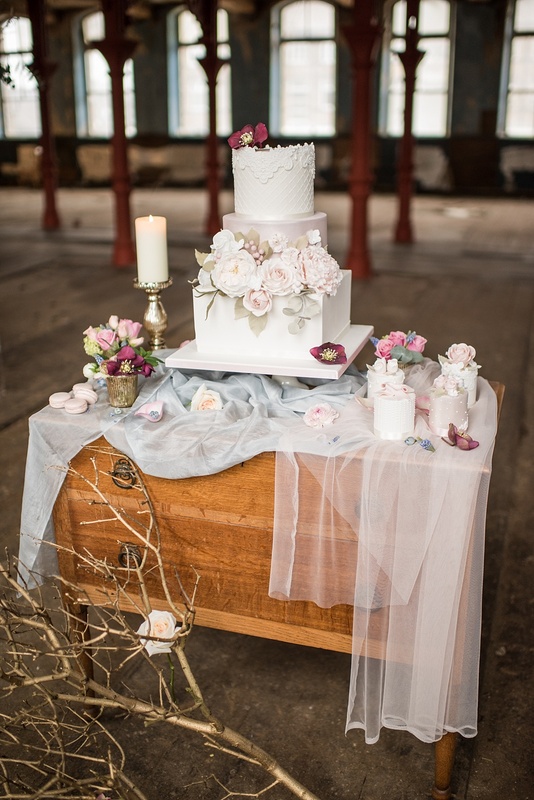 Set against the industrial backdrop of an old mill, this is a photo shoot of contrasts, and we just love the attention to detail on the cake, stationery and floral displays – the perfect ‘onstage’ props! 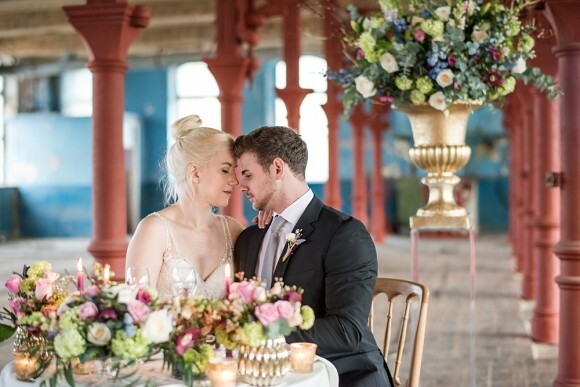 The photographer, Jane Beadnell teamed up with a host of talented suppliers to bring this dynamic and dramatic shoot to life. 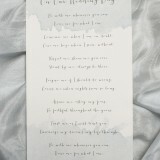 Here, she gives us an inspiring insight into the day. 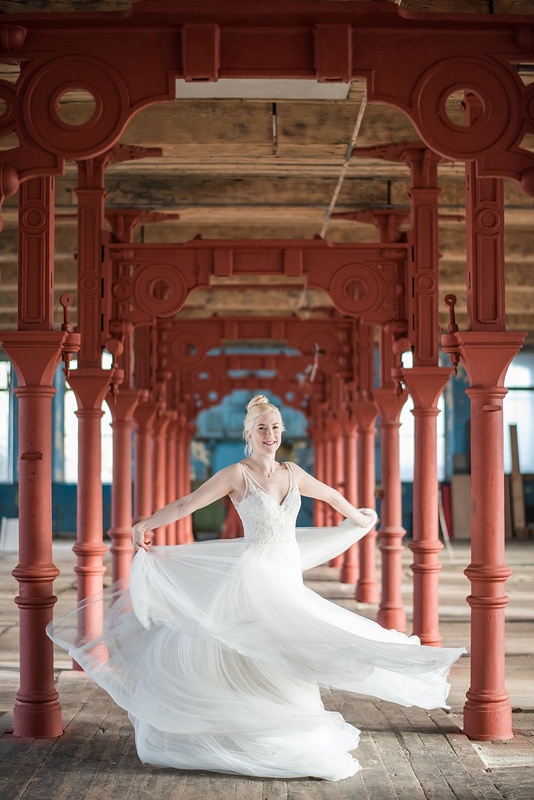 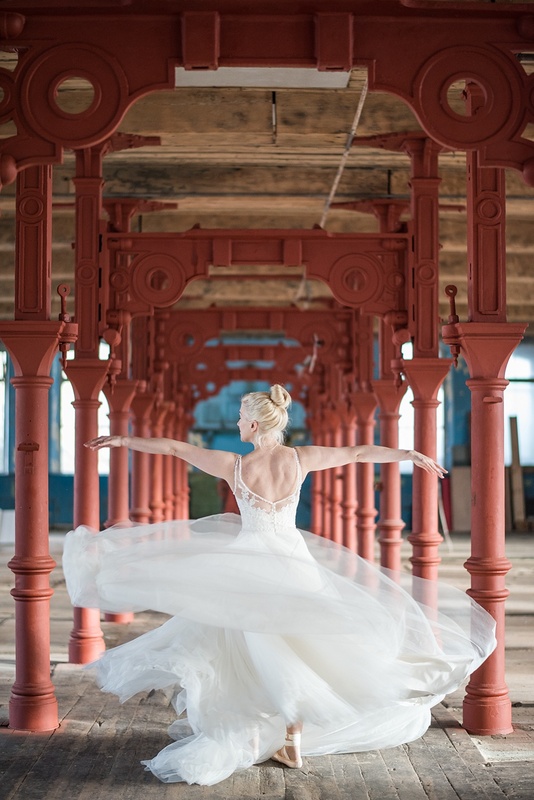 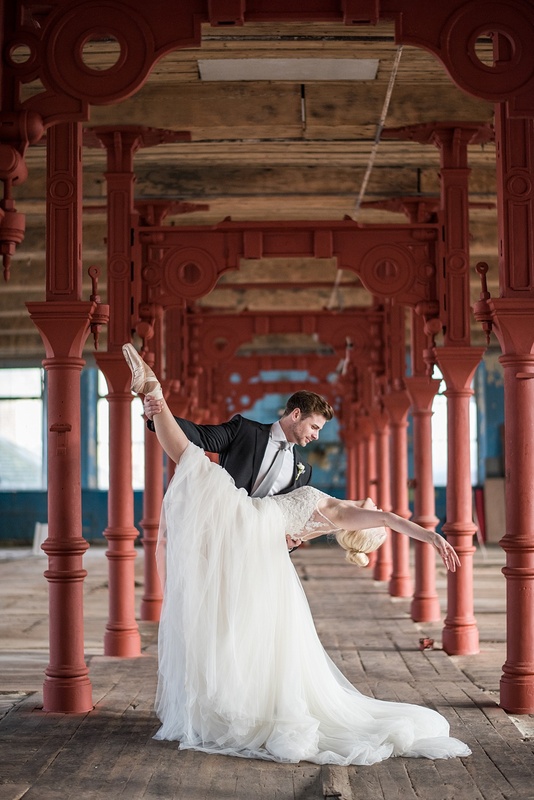 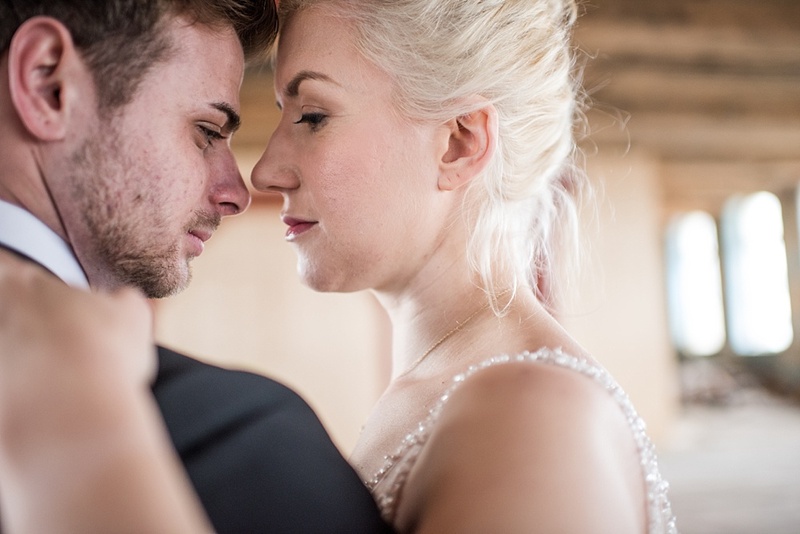 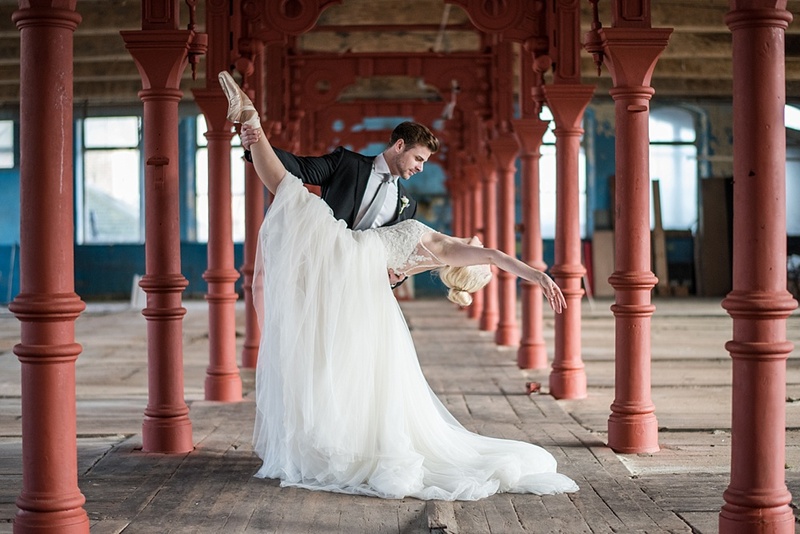 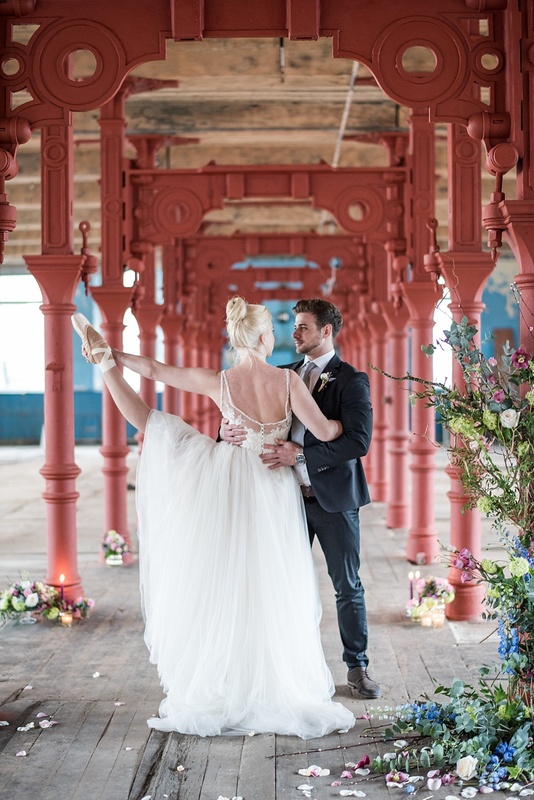 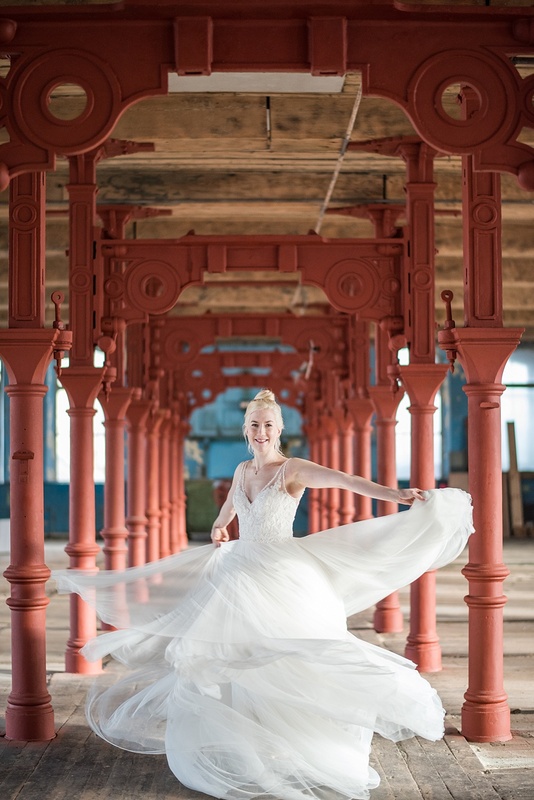 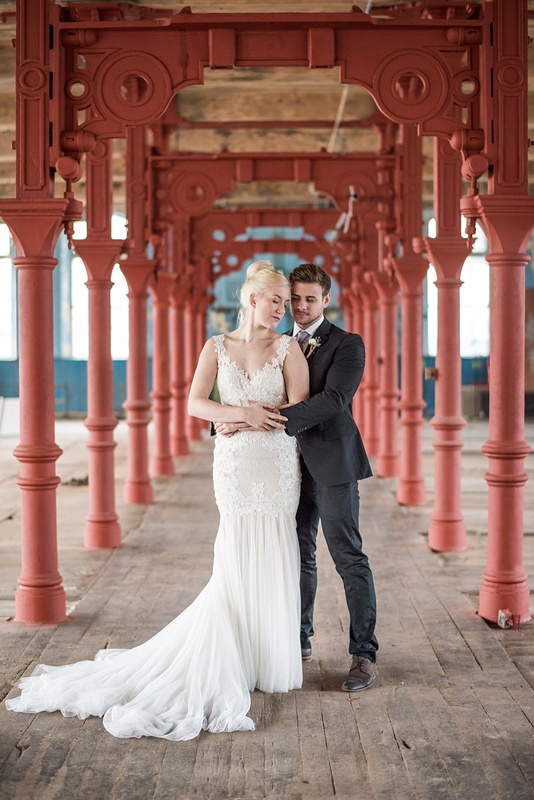 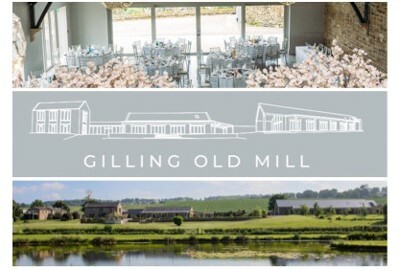 jane says: We chose Dalton Mill for our styled shoot because of its raw harsh look, which contrasted with the pure soft ballet look of the dress and dancer. 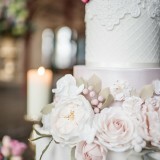 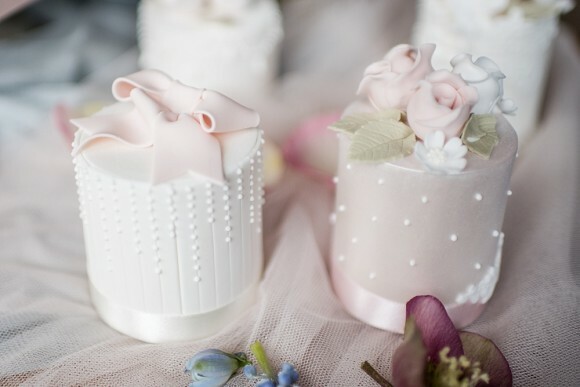 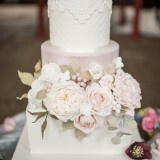 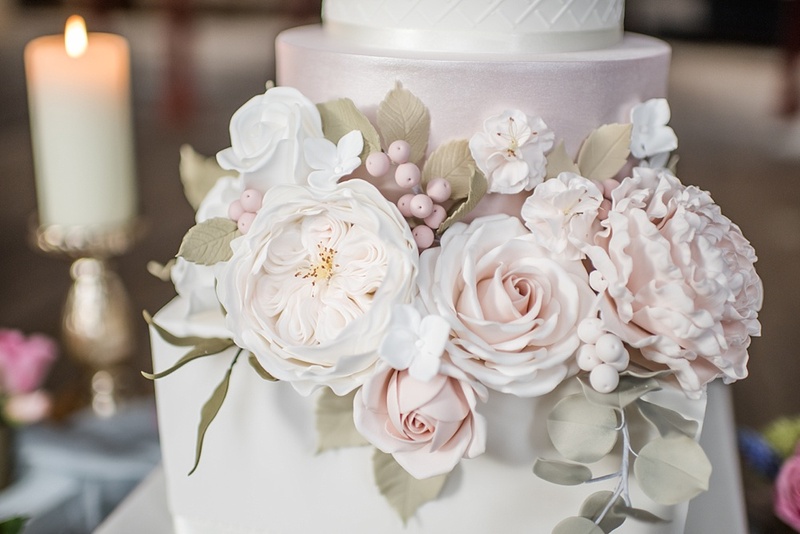 To coincide with our pastel theme, Dominique from boutique shop and kitchen, Poppy Pickering, incorporated lots of soft tones into the wedding cake design and used a mix of pretty sugar flowers. 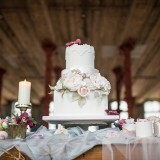 A delicate blush pink tier added a hint of sparkle and romance. 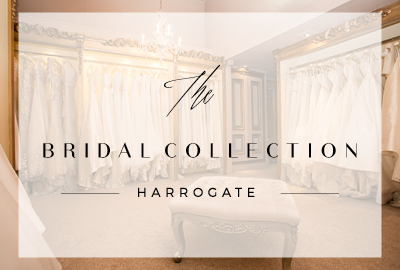 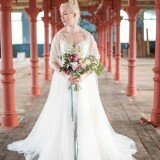 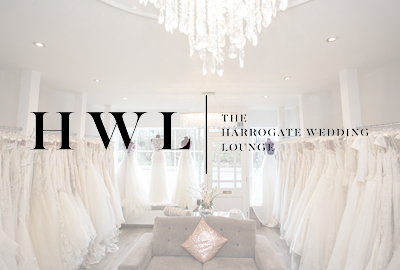 The Bridal Gown, located in Otley, supplied the dresses for our shoot. 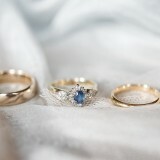 The designs both came from the Wtoo by Watters collection. 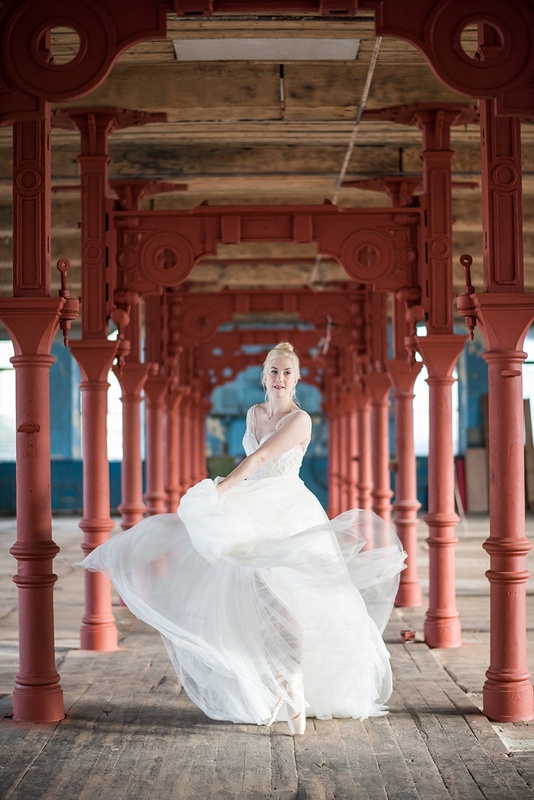 The lovely Locklin with its big tulle skirt was selected to show off the movement of the dancer and give a soft delicate romantic feel, in stark contrast to the decay of the industrial mill. 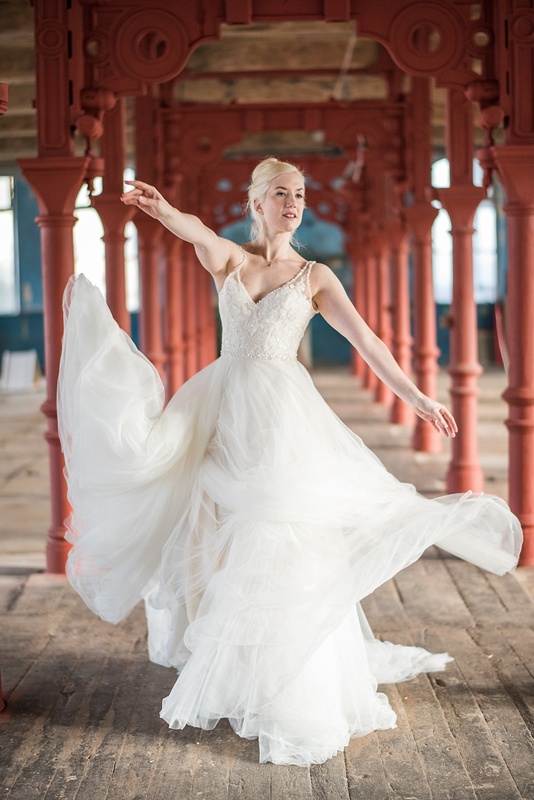 The fishtail Masha gown, meanwhile, was selected to add glamour and highlight the toned shape of the dancer’s body. 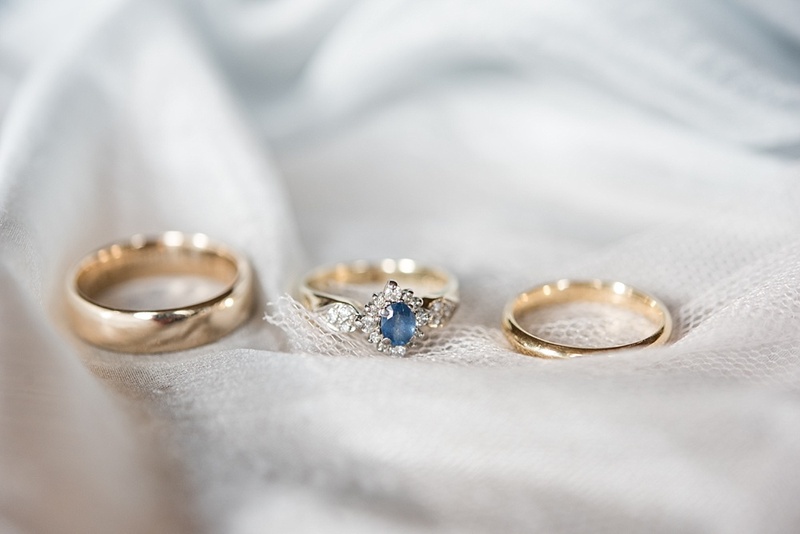 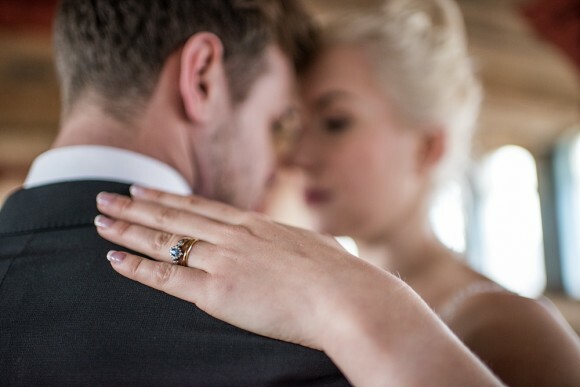 Perfectly completing the look – The Ethical Jeweller also supplied us with gorgeous wedding bands for the shoot. 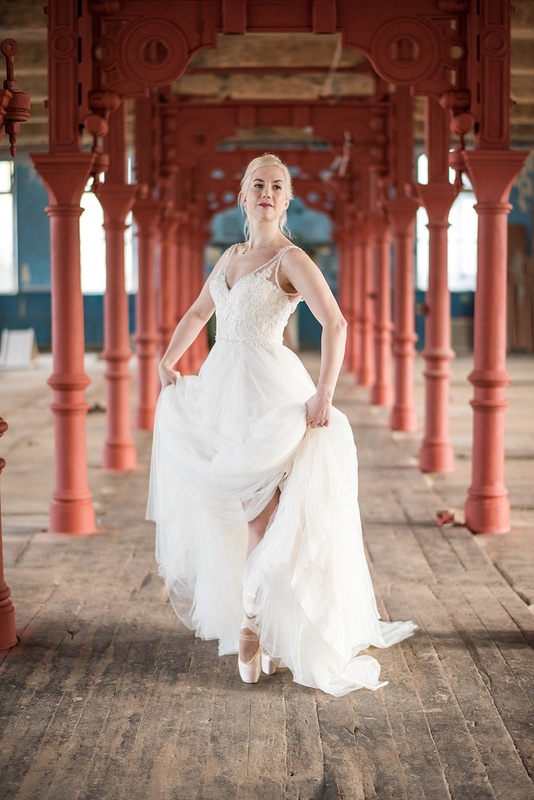 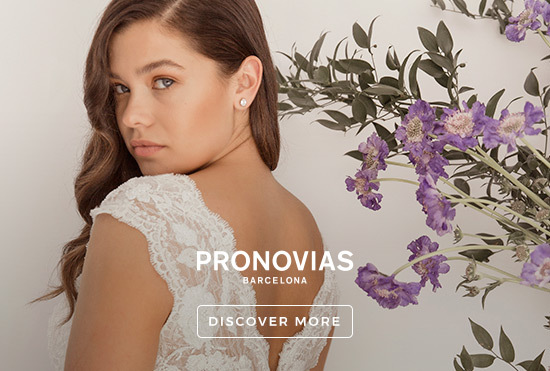 As the aesthetic was light and airy – to replicate the delicacy of the gowns and complement the ballet theme, Leeds-based hair and makeup artist Natalie Willingham kept our lovely model’s make up fresh and dewy. 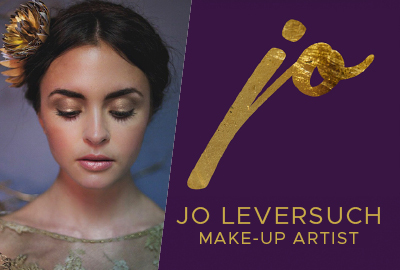 She gave her rosy cheeks, brushed natural brows and a soft pink lip to mimic the model’s own natural lip colour. 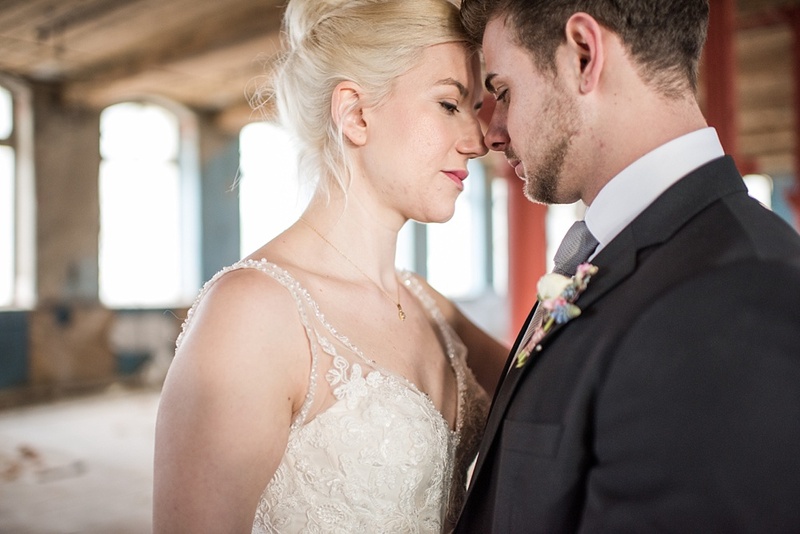 We had already decided on an unstructured, messy top-knot, however, the challenge of having no electricity on-site confirmed that was the style we were going for! 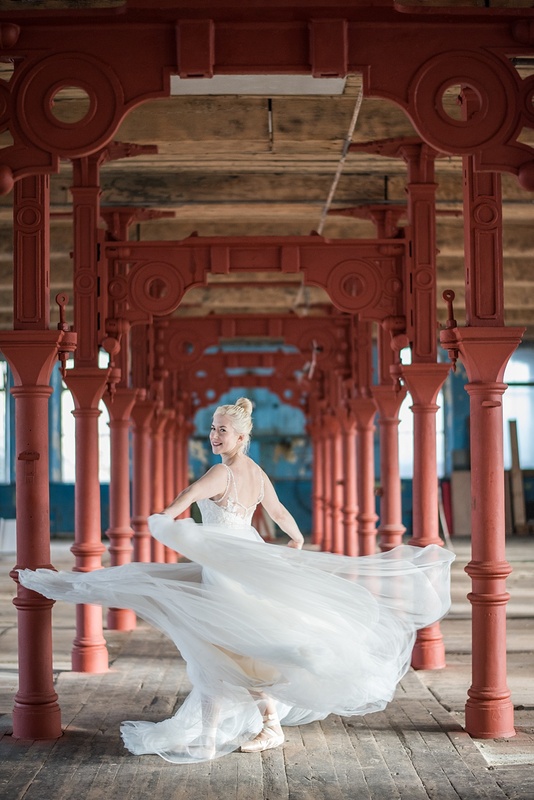 Keeping lots of wispy elements around the hairline added to the soft delicate feel to the shoot, as anything too styled and sleek would have been too harsh and dramatic. 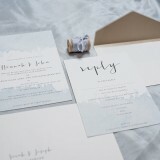 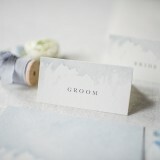 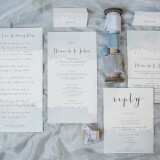 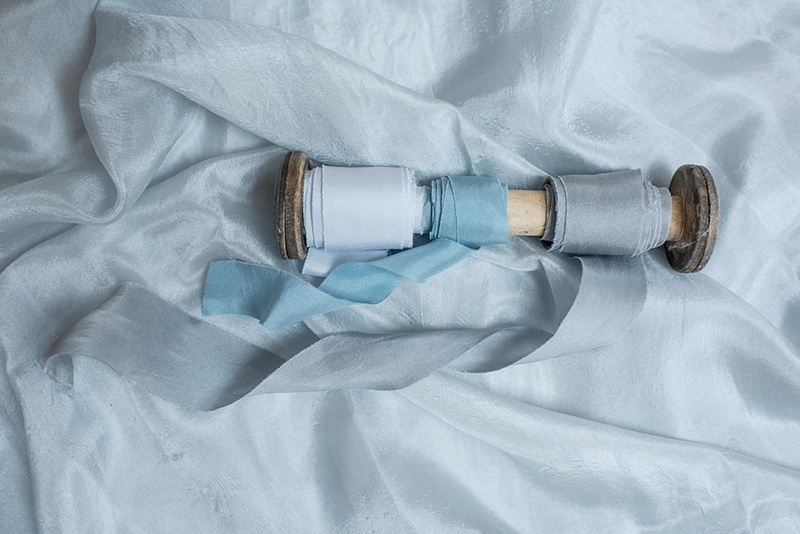 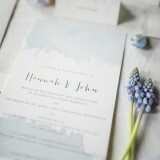 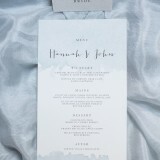 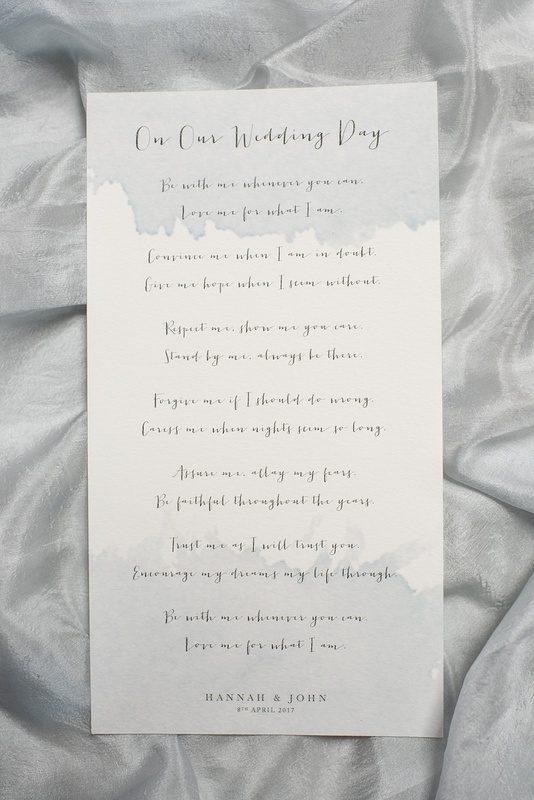 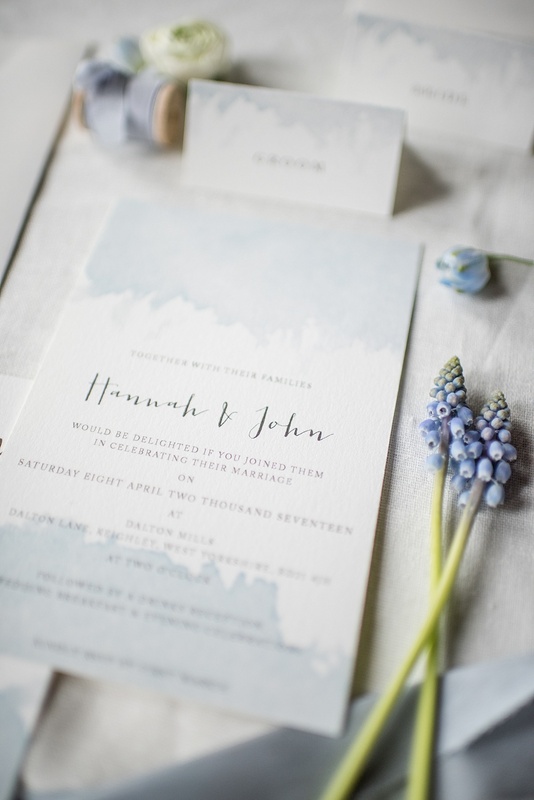 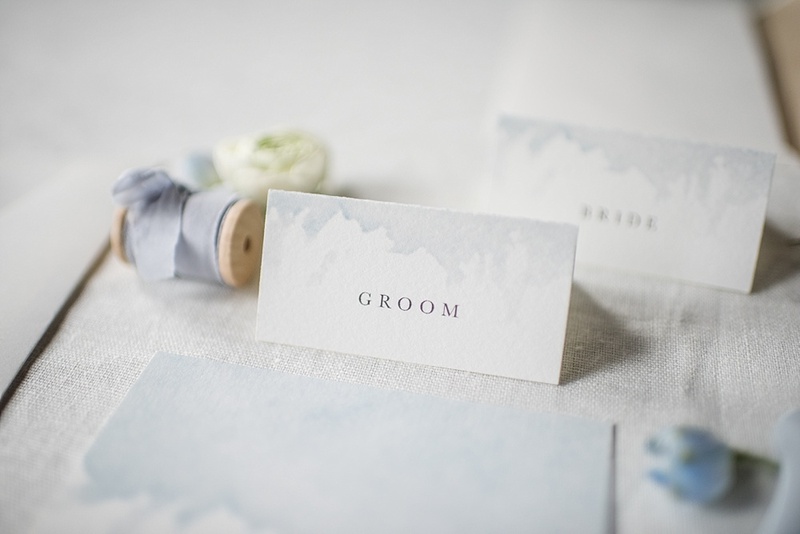 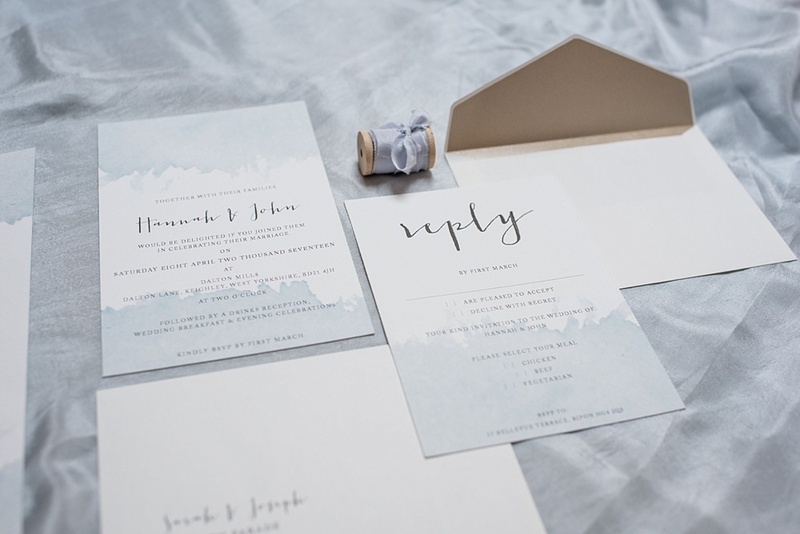 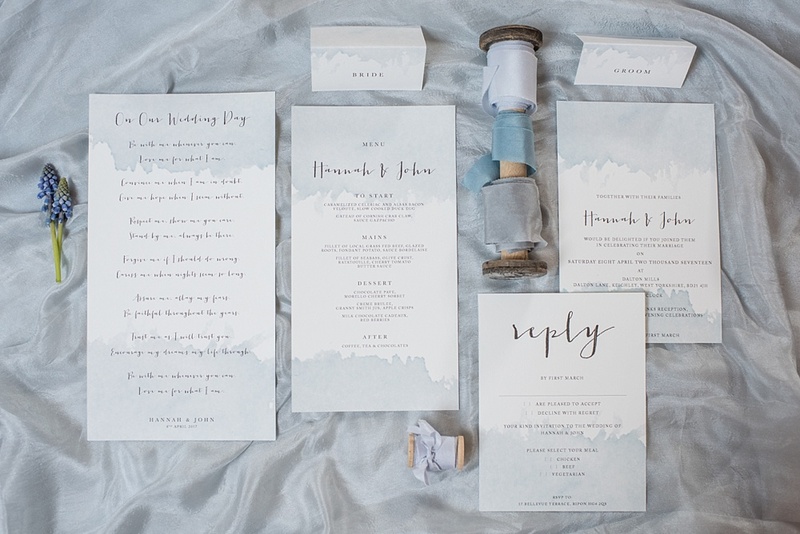 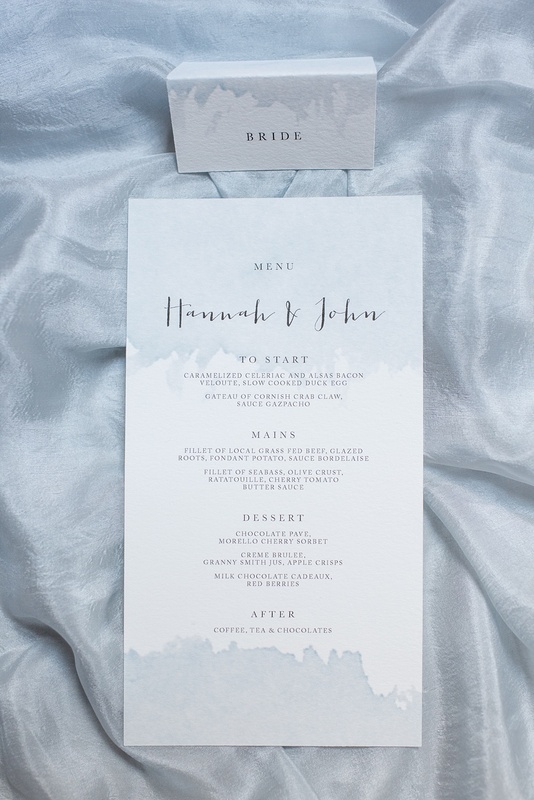 We featured soft torn edge stationery, designed by JB Creatives to reflect the movement of the ballet theme, with pastel tones of watercolour blue. 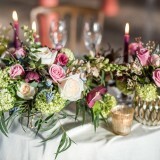 For the flowers, supplied by Leafy Couture, we wanted elegant and timeless displays with a seasonal twist. 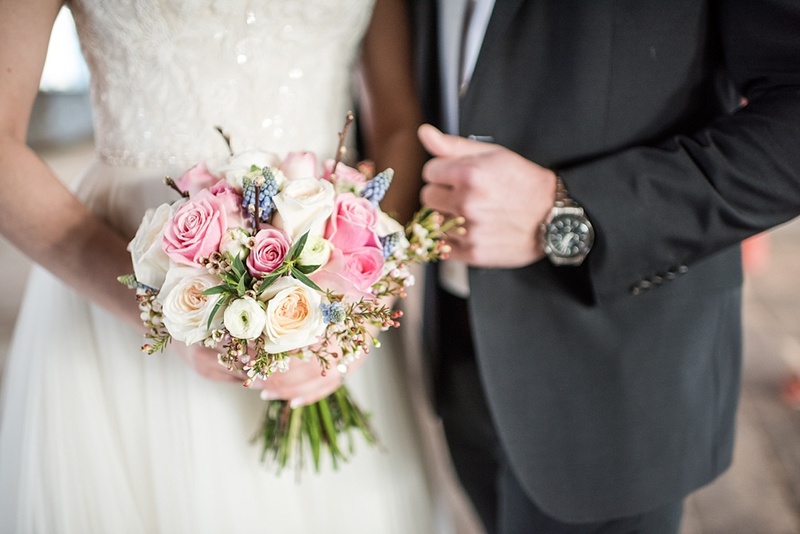 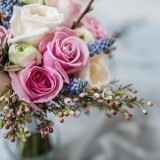 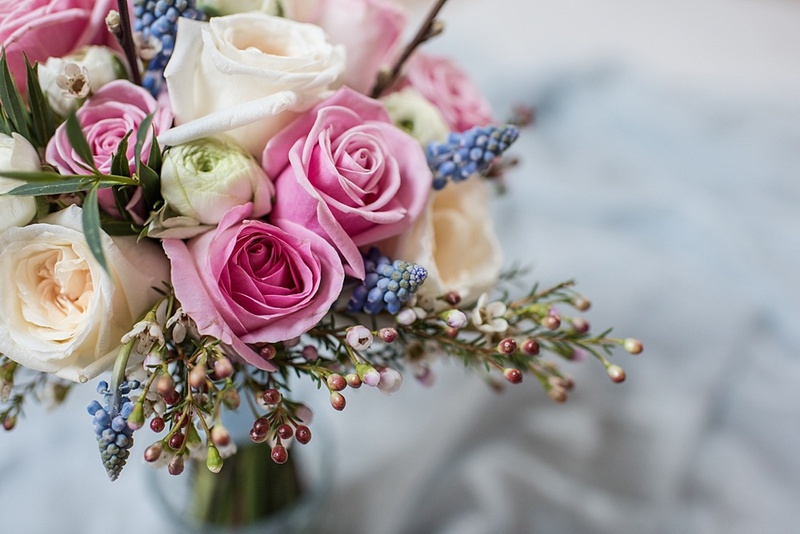 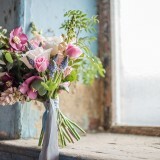 The bouquets featured classic romantic roses with touches of blue muscari and spring hellebore. 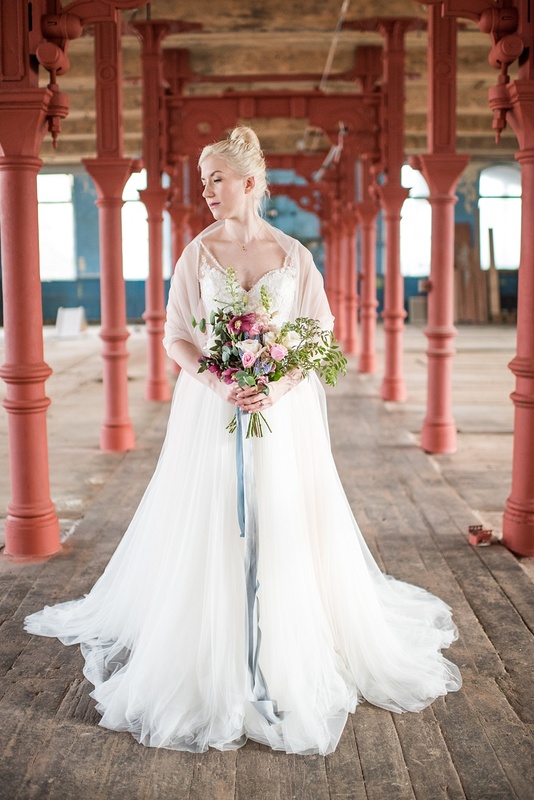 One bouquet was looser in style with more textures to contrast against the large tulle skirt. 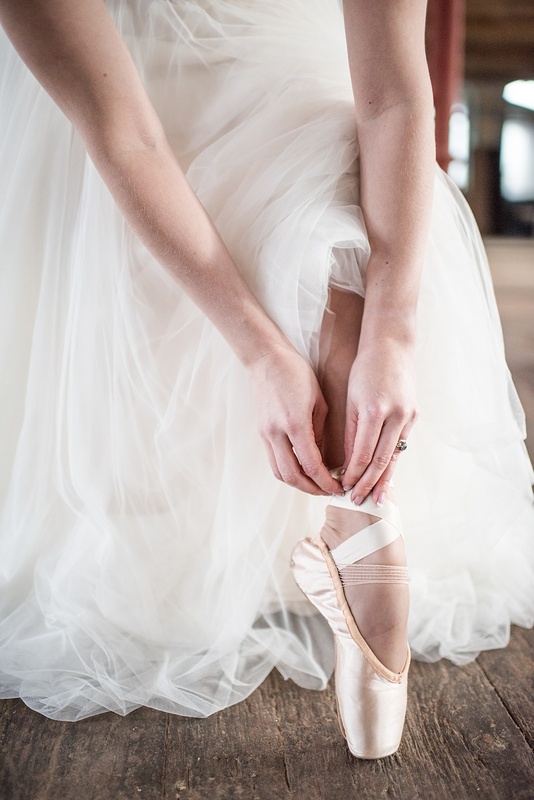 The other bouquet was more rounded to compliment the classic ballet theme. 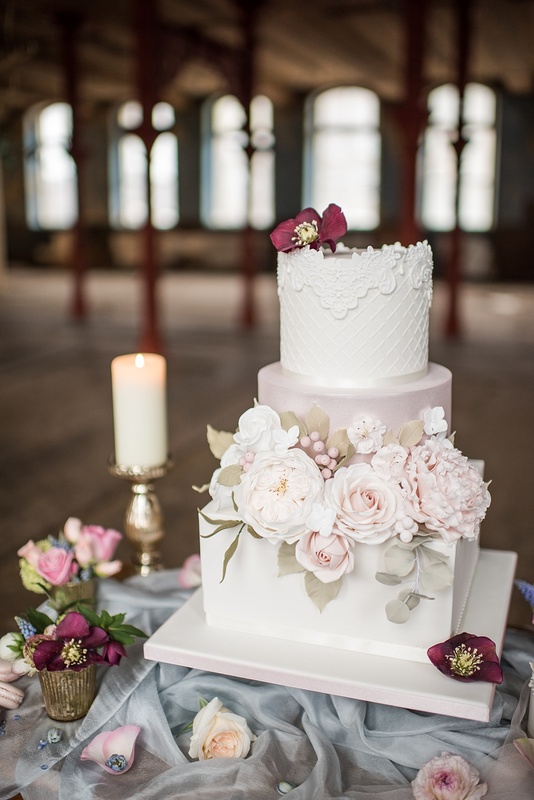 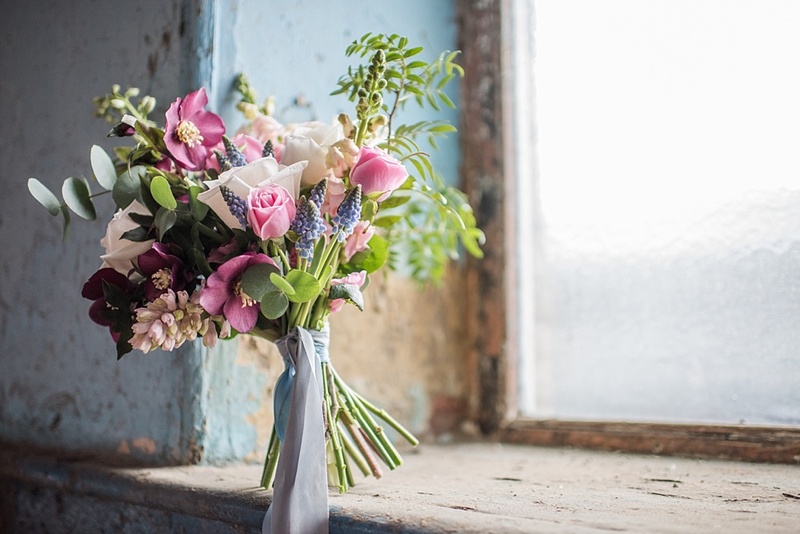 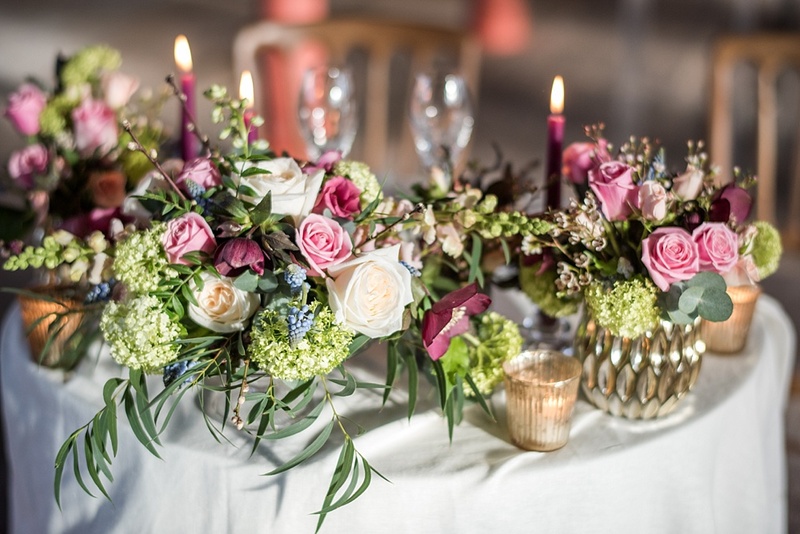 The overall colour scheme was ivory and blush with hints of blue and touches of deep maroon. 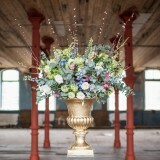 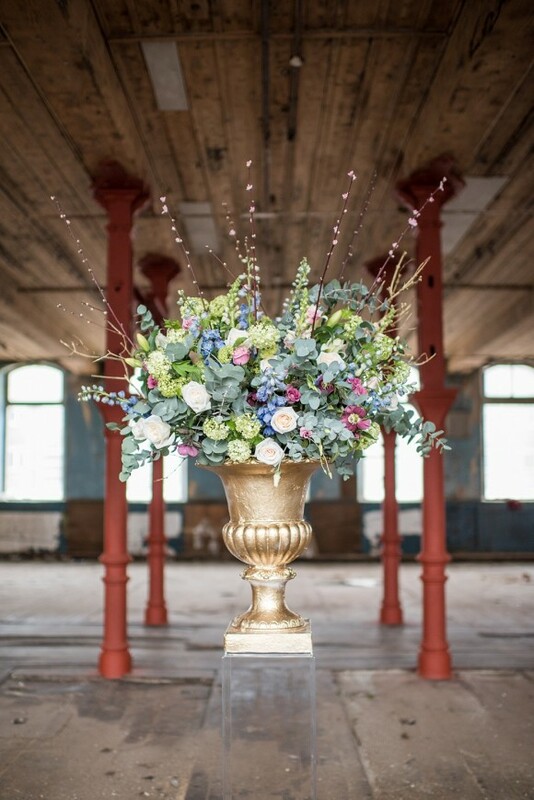 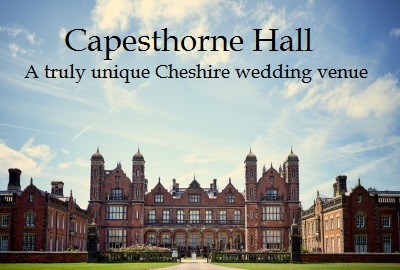 The large urn was created using scented Ohara roses, delphiniums, viburnum opulus, cherry blossom, Lisianthus, eucalyptus and lots of gold branches. 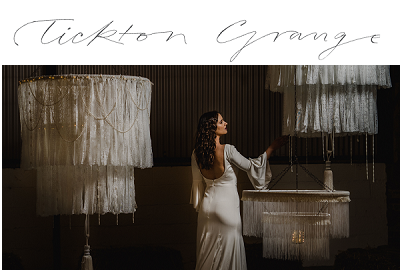 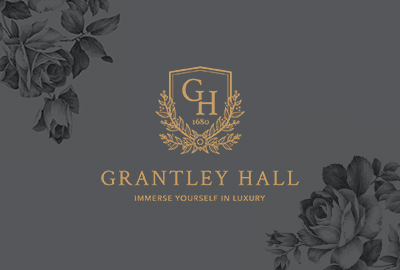 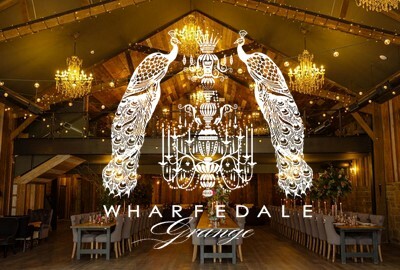 We wanted it to feel grand, opulent and pretty. 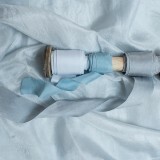 Sophie at Pompom Blossom provided silk ribbons for the bouquet and stationery. 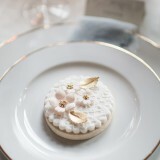 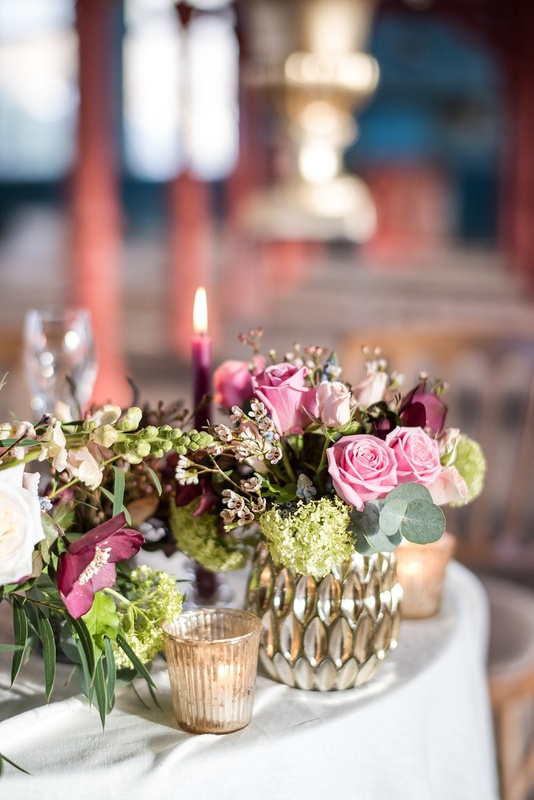 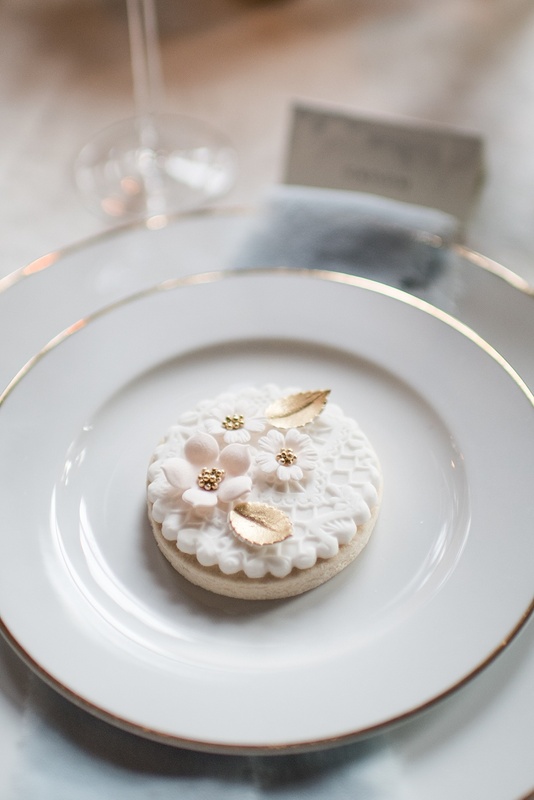 The sweetheart table was dressed by Eden and Eve, with pretty golden pots of flowers to match the shoot’s theme and a cake stand dressed with an opulent trailing display. 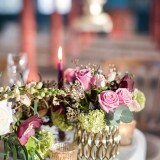 Dark candles added depth to the table scape and golden votives brought warmth to the display. 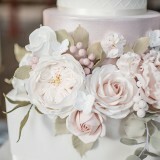 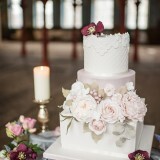 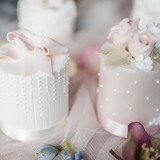 We also used lots of pretty flower heads to dress the cake and stationery to add to the pretty feel. 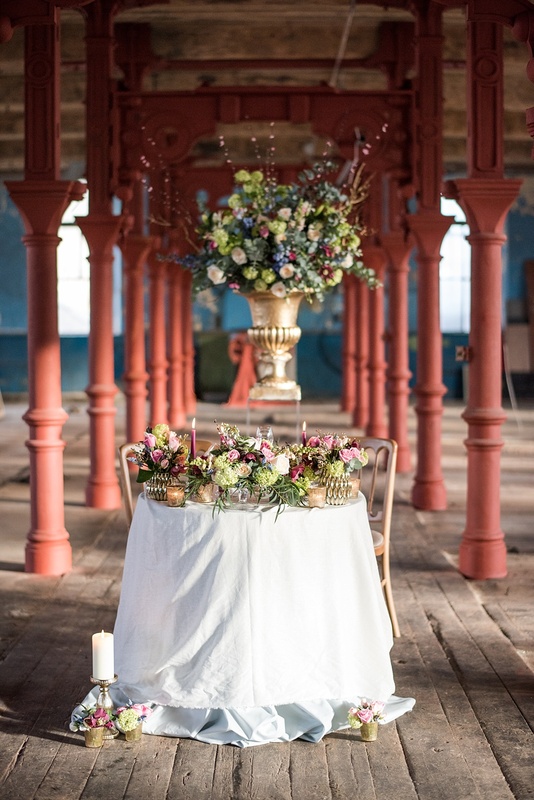 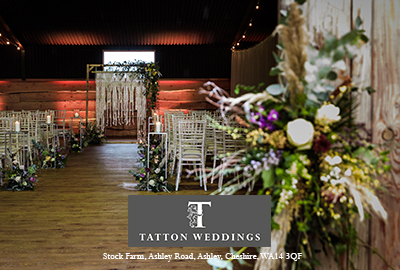 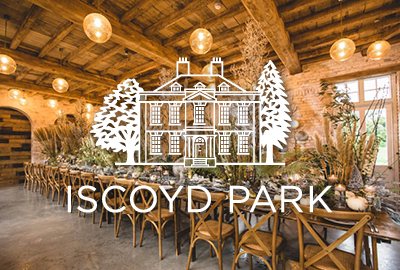 For the ceremony, we created a beautiful installation of flowers and foliage to look like nature had sprung and was growing up one of the columns in the centre of the room. The flowers were arranged with an organic flowing feel to add to the romantic setting and provide a stunning frame for the couple. 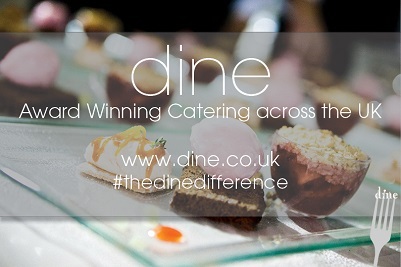 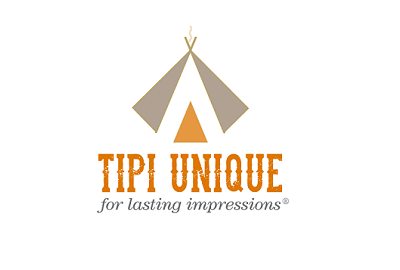 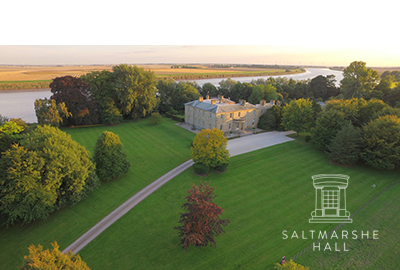 It was an honour to work with such a passionate and talented team of suppliers. 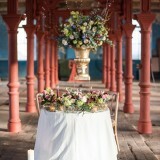 We all supported and helped each other throughout the shoot in order to achieve the final outcome. 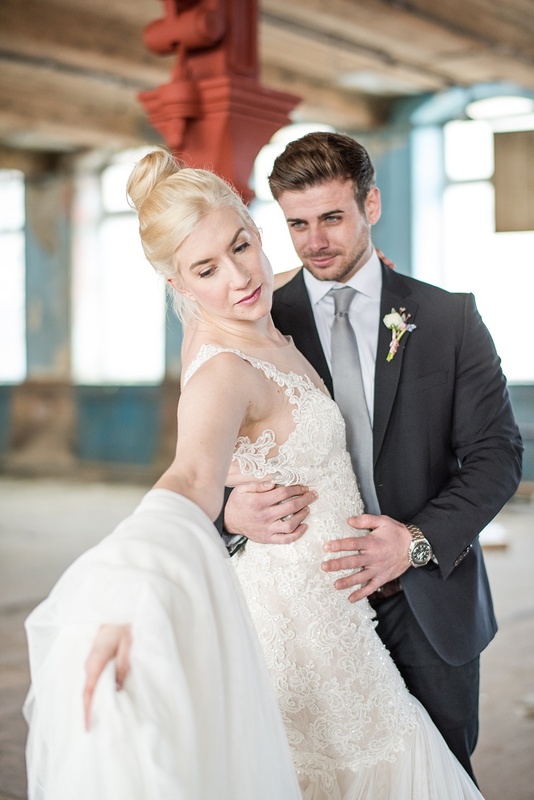 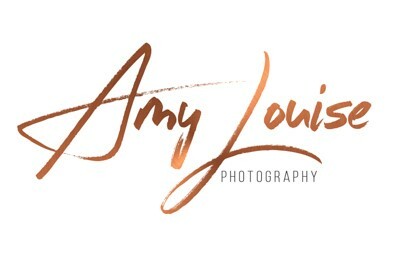 Since completing the shoot, it’s been great to hear that hair stylist and makeup artist Natalie has recently expanded her business to add a personal beauty shopping range, perfect for brides-to-be.